In this TV spin-off of “The Six Million Dollar Man”, tennis pro Jaime Sommers (Lindsay Wagner) was almost killed in a skydiving accident, but her fiance Col. Steve Austin (Lee Majors) convinces the Office of Scientific Intelligence (OSI) to give her life saving bionics similar to his own. After a near fatal rejection episode, she begins using her bionic legs, right arm and right ear to go on missions as an agent for the OSI and help stop the bad guys. Her bionics give her just enough in the way of super powers to be quite formidable. Her boss at the OSI is Oscar Goldman (Richard Anderson)s and the Doctor responsible for all of the top secret bionics is Dr. Rudy Wells (Martin E. Brooks). As a cover for her extra curricular activities as a spy she takes a job as a schoolteacher and lives with Steve Austin’s parents. ABC decided to cancel the show in late 1977 so NBC bought the rights and carried the series for an additional year. NBC, in trying to expand the audience, added a new character in the new season. 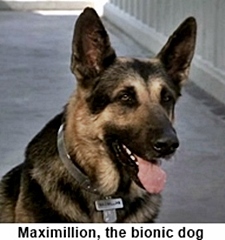 It was Maximillion the bionic dog, so named because his bionics cost one million dollars. Ironically, although now on different networks both “The Six Million Dollar Man” and “The Bionic Woman” were both canceled on the same day at the end of the 1978 season. Richard Anderson passed in 2017 at 91 years old. The Jaime Summers character was added to a double episode of The Six Million Dollar Man to give Steve Austin a love interest and boost audiance share. 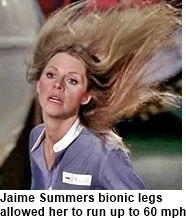 The character was so popular with the viewers that ABC decided to do the spin-off series Bionic Woman.